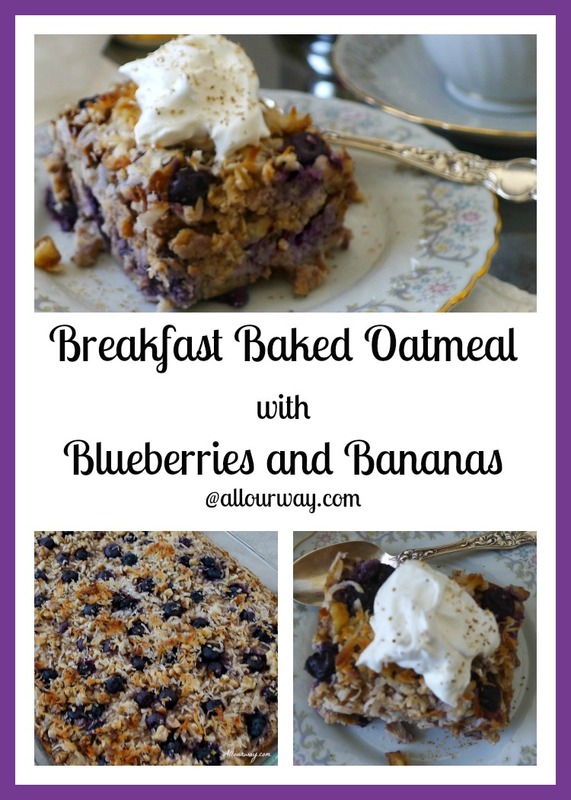 We are in a breakfast rut so we decided that starting with a recipe such as Breakfast Baked Oatmeal with Blueberries and Bananas is going to help change that boring routine. Yessiree!! Monday and Thursday will no longer be oatmeal with nuts topped with protein powder mixed with yogurt. Tuesday and Friday won’t be homemade granola topped with protein powder mixed with yogurt. Wednesday and Saturday won’t be bagels with peanut butter and honey. Sunday, our special break out of the routine day, will no longer be two fried eggs and toast. For more than twenty years, you could have guessed what day of the week it was, just by what we ate for breakfast. How boringly predictable! Now you’d think since we love to cook, we love to eat, and we love to write about food, that we would have come up with some interesting recipes and variations for breakfast, wouldn’t you? Well , our breakfast baked oatmeal with fruit, coconut and nuts is just the beginning. The recipe was easy to make in a big casserole dish and prepare the night before. In the morning all we did was warm it. It tasted delicious with a dollop of whipped cream on the top. What a win-win for us! It tasted great and it saved us time. I doubled the recipe and came out with a total of 18 servings. Wouldn’t this be just the dish if you were having company for a breakfast or brunch? Our Breakfast Baked Oatmeal with Blueberries and Bananas recipe is just the start. We are going to make our breakfasts exciting. Our morning meal is going to by as tantalizing as our lunch and dinner. No more “blah”. No more ho hum. No more being able to tell what day of the week it is by our breakfast. If you like breakfast casseroles you may like Smoked Salmon Breakfast. We make it every year for brunch Christmas morning. What is your favorite breakfast or brunch? This delicious baked oatmeal with fruit, nuts, almond milk, coconut oil is a healthy and different alternative for your regular morning cooked oatmeal. Preheat the oven to 375 F with a rack in the top third of the oven. Generously butter the inside of a 15 x 10 baking dish. In a bowl, mix together the oats, half the walnuts, the sugar, the baking powder, cinnamon, protein powder, and salt. In another bowl, whisk together the milk, eggs, coconut oil, and vanilla. Arrange the bananas in a single layer in the bottom of the prepared baking dish. Sprinkle 2/3 of the berries over the top. Cover the fruit with the oat mixture. slowly drizzle the milk mixture over the oats. Gently tap the baking dish several times on the countertop to make sure the milk mixture fills in through the oats. Scatter the remaining berries and remaining walnuts across the top. Sprinkle the toasted coconut over the walnuts and berries. Bake for 35 to 45 minutes, until the tip is nicely golden and the oat mixture has set. A toothpick stuck in the middle of the dish should come out moist but not runny. If the top is browning too quickly loosely top with aluminum foil. Drizzle with some maple syrup if you want it a bit sweeter or sweetened whipped cream. The second time we ate this for breakfast we mixed a scoop of protein powder with 1/3 cup plain yogurt and put it over both our oatmeal bake. We doubled the recipe and froze the extra. If you like you can easily halve the recipe and make this in a 8-in square baking dish. 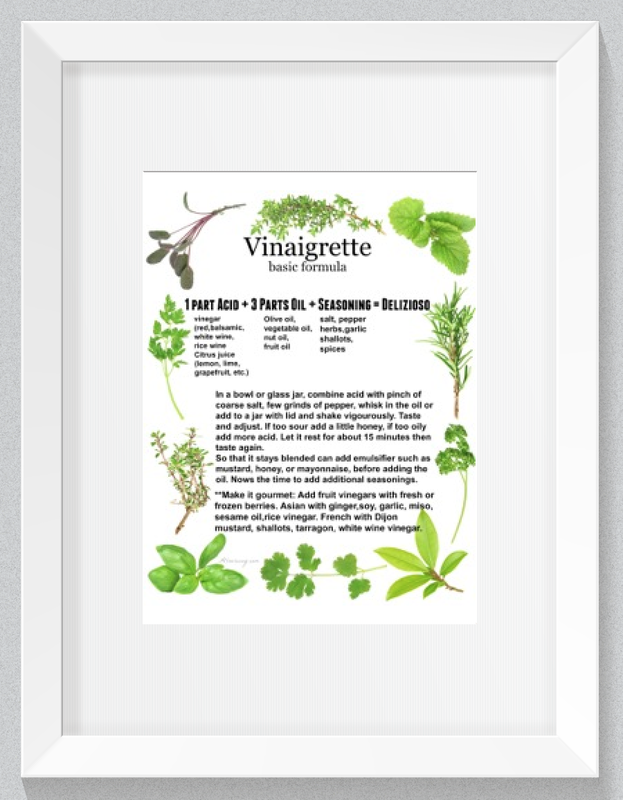 Note: Recipes and content from ©All Our Way is copyright protected. Please do not use content or recipe without prior written permission. If you want to share the information please link to this post. Grazie. I will be the first to admit that I am NOT a breakfast person. I KNOW that is a bad thing…and I am trying to change that. I can’t function without coffee, but I can go without eating. Having something like this is perfect. I can make it ahead of time, and just warm it up in the morning. This would work for me. It is a great way to start the day for sure. Hi, Gloria!! The breakfast baked oatmeal makes the coffee taste all the better. That is one delicious and healthy breakfast ! You have got all the components in there carbs, protein and fruits! This is totally my kind of breakfast, we do sometimes get stuck in a rut! I definitely need to make this! Hi, Priya! I do hope you give it a try. Oh my! What a beautiful dish and so hearty and delicious!! This would be perfect for any holiday breakfast/brunch get together or just a regular weekend around the house. I love the combination of both blueberries and bananas.. great recipe!! Hi, Heather! It’s also great to cut up and freeze. It still tastes great and you have something great tasting when you don’t have the time. We tend to have the same things for breakfast as well. But this baked oatmeal does look like a great reason to try something else! Hi, Jodi! We were so sick of regular oatmeal! This is such a great switch. Hi, Tammy!! Yes, we do like the addition of protein powder. We do the same with our muffins. I am so hungry right now just looking at these pictures. I love the blueberry’s paired with almond milk, so healthy! This looks like a dish I could cook up for the family and they will fall in love with it! Thank you! My pleasure, Tina. You can substitute other fruit too. This is brilliant. This is perfect for our weekend family brunch. Thank you, Wanda! It is so easy!! I’m so in love with breakfast dishes that can be made to feed the whole family, or overnight guests. This looks so good Marisa!! Thank you, Kylee. I’m with you — I really like doing things ahead. I love oatmeal for breakfast but I usually just make oatmeal porridge. This would be great for the weekend brunch. Love the flavors, but mostly how simple and easy this is to make. Blueberries are my favorite so I’m saving this to try soon. I bet your kids will love it too, Veena! Now this is a great breakfast especially around holiday that I have a house full. I am printing this off to make for all my holiday guests they will surely enjoy this one! Hi, Claudia! It’s nice having something made ahead of time, especially when the holidays are so busy. This is a perfect Sunday morning breakfast for the family! Yes, it certainly is!! Thanks for commenting. I love breakfast casseroles. I have several on my site too. The perfect way to feed a crowd, but also to have leftovers to warm up easily during the week. I am a blueberry fanatic…so this is right up my alley. 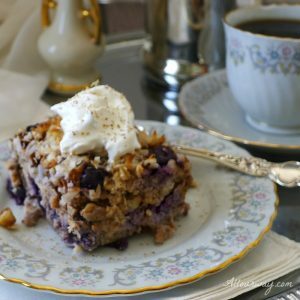 This blueberry bake sounds amazing, I must make it for a brunch, it looks so good and flavorful! I am going to be trying different variations — this is just like the no-churn ice cream we discovered. I am going wild. Have a nice weekend. I love a baked oatmeal for breakfast, I mix mine up the night before and then put it in the oven first thing to cook whilst I have my shower. I’ve not had it since the end of summer. Thanks for the reminder. Well, I love reminding people 🙂 After all I’m a mom and sometimes known as a nag, but lovingly so. you made my sunday! can’t wait to try it! Nice part about it is you can do like a recipe for minestrone — use what’s in season and keep the rest the same!! I’ve got some ideas for variations. Buona fine settimana. This sounds and looks amazing. I love the idea of cooking it the night before. Those blueberries are gorgeous. Thank you Tina Marie! We bought 10 pounds of blueberries while they were on sale and then froze them. It’s great having some on the off season. Thanks for commenting. 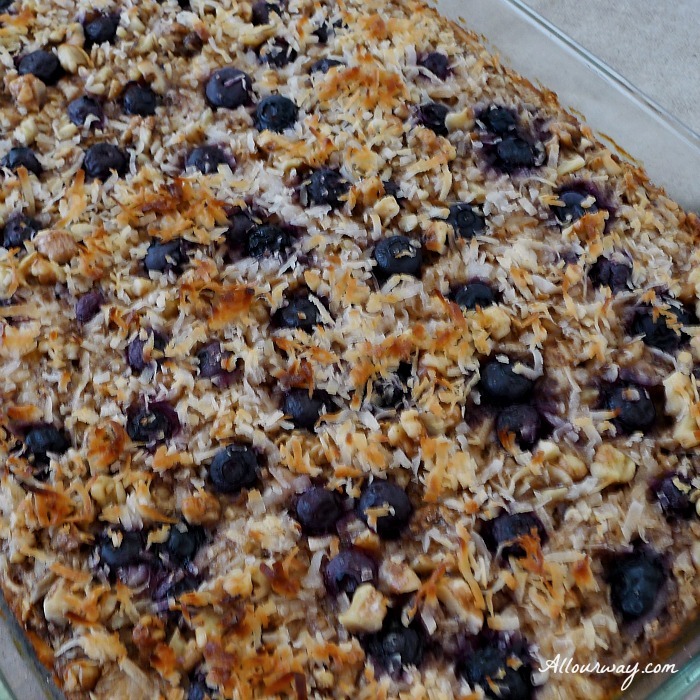 Baked oatmeal is a wonderful idea to get the protein in my boys before school. 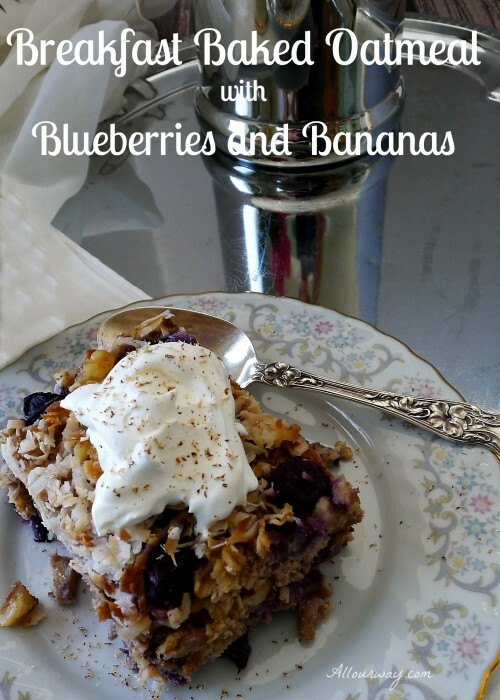 I love this idea and the bananas and blueberries just make it seem like dessert for breakfast. I wish I would have made this years ago. I have another combination I’m going to try. Thank you for commenting. I’ve been so busy lately that I haven’t had much of a chance to visit my favorite blogs . . . and you’re one of them! And then I read the sweet (and funny) comment you left on my Oatmeal and Chocolate Chunk Cookie post – and had to come by to see what you’ve been up to. For me – I LOVE brunch! I love to eat brunch-inspired foods, and it’s also my favorite time of day to entertain! Casseroles like this one are great for brunch . . . breakfast and dessert, too! After reading the ingredients . . . I can vouch that it’s quite healthy. Protein powder?? That is so unique! It’s low in sugar too. And I like that the sweetness comes from the fresh fruits – YAY!! This looks like a dish that I could actually eat. My diet is still incredibly strict!! We have company coming into town tonight, and they’re going to stay with us through the weekend. I think this might make a great dish for Saturday morning. I’m excited to try it! As always, your visits/comments make my day!! Hi Suzanne! I’m sorry to hear your diet is still so strict especially you are such a creative cook and your desserts are out of this world. :-( I wish I would have made this oatmeal a long time ago — you can pour maple syrup over it in the morning if you like it sweeter. Our whey protein powder is not extremely sweet — we like it that way, but adding it to the oatmeal ensures getting the extra protein which we like. I am anxious to make your cookies for our grandsons — will let you know how they turn out. Have a wonderful weekend. Sending big hugs!! You can bet I’ll be running out of bed if I know this is waiting for me at the end of my sprint! Love the combination of flavors here, my friend! Cozy and delicious! We have all the ingredients for this delicious looking breakfast bake; our kids will love this one! Thank you for commenting. If your kids likes things a little sweeter just pour on a little pure maple syrup!! YUM! I love to have fruits and oats for breakfast. It is like a super great start to your day. It is almost like cheating a little by eating dessert. It really is a welcome change — I’m dreaming up some alternatives. I love having it made up in advance because we like to get started right away in the morning. Have a wonderful weekend and thank you for commenting. che deliziosa colazione Marisa ! Grazie chiara! Spero che tutto va bene? I get so bored eating the same kind of oatmeal everyday that I love coming across new ideas like this one. What a great idea – baked oatmeal. I don’t like the regular breakfast oatmeal but this looks delicious Marisa. Definitely something different for breakfast. I look forward to your future breakfast ideas.